On 12 March, the Magistrate’s Court ruled that the settlers who invaded the Bakri family home in Tel Rumeida in Hebron in 2001 must be evicted within 45 days. The verdict comes after 18 years of litigation in courts, where time and time again the various courts ruled that the settlers must leave, yet where the settlers managed to evade implementation and submit new legal proceedings designed to buy them time and exhaust the Bakri family. The settlers, who entered the house in the thick of the Second Intifada while the Bakri family was not at home, initially claimed that they had a lease agreement with the owners. They later claimed that they had purchased the house, and finally they even tried to claim that the land was owned by a Jewish trust before 1948 and that they now represent it. All of their claims were rejected by the Civil Administration and the courts, and the police even determined that the documents they filed were forged (indictments were filed following the forgery). However, as noted above, throughout the years the state refrained from evacuating the invaders despite the clear assertions that this was an illegal invasion. In the ruling handed down last week, the judge rejected the settlers’ claim that even if they are not the owners of the house, according to Ottoman law they have the right to purchase the house by virtue of their residence for years and by the investment and renovations they made in the house and renovated the property. The court rejected their claims and ruled that the settlers acted in bad faith, stole the property without permission and must evacuate it within 45 days and even pay the Bakri family usage fees. The settlers now have 45 days to file an appeal against the ruling, and after the appeal is rejected it will be possible to begin proceedings for the eviction. 2001 – The Bakri family was forced to leave their homes following settler harassment, and settlers take over the house – During the Second Intifada the Tel Rumeida area in Hebron was like an urban battlefield: shootings, tanks in the streets and thousands of Palestinians under continuous curfew. In the Bakri family yard, settlers used to gather together to celebrate and sing, sometimes throwing stones at the house, attacking family members and even cutting off the vines planted by the family in the yard. The Bakris decided to leave the house until the situation calmed down. In the meantime, settlers entered the home and damaged the house, furniture and belongings. The Bakri family tried to defend the house by filing complaints with the police, sending a metalworker to seal the windows and doors (which required coordination with the army because the area was closed to Palestinians), and even tried to find someone who would agree to live in the property and guard it, but because of the ongoing closure, settler attacks and lack of law enforcement against the settlers, they did not succeed. To read the Civil Administration report on the Bakri house (in Hebrew) – click here. 2004-2005 – Settler families move in the Bakri home – Around 2004 to 2005, settler families entered and began to live in the Bakri family home. The Bakri family filed a complaint with the police demanding that they be evicted, but the police in response claimed that because more than 30 days had passed since the invasion, they had to apply to the court for an eviction order. 2005-2006 – The first evacuation claim: The court orders the settlers to vacate. In June 2005, the Bakri family was forced to hire an Israeli private investigator to investigate the identity of the families who invaded the property. On 30 March 2006, the Magistrate’s Court ruled that the families must vacate the property. However, settlers continued to live in the property. Later, the company of Tal Investments and Construction, owned by settlers, announced that the settlers were living in the asset on its behalf and that it had purchased the property from the owners, as we shall see below. In addition, Shai Nitzan announced that the police had opened an investigation on suspicion of forgery and fraud in connection with the entry of Jewish families into the Bakri house. But all this did not cause the authorities to lift a finger to evict the settlers. As far as law enforcement is concerned, the settlers can continue to make a mockery of the law and court decisions, and the Bakri family can continue to bang their heads against the wall and demand the eviction again and again. 2008 – Petition to the High Court of Justice – The Hebron Municipality and Zakaria Bakri petitioned the High Court of Justice (HCJ 5979/07) demanding that the law be enforced in Hebron, including on the settlers in the Bakri house. As a result of the petition, the state issued an eviction order against the settlers in a procedure called the “Disturbing Land Use Order.” The order was issued on 27/3/08, and immediately afterwards the settlers petitioned the Military Appeals Committee to cancel the order on the pretext that more than three years had passed since the invasion of the house. The Bakri family found themselves in three different legal proceedings: the eviction proceedings in the Magistrate’s Court (CS 15372/06), the demand to enforce the law in the High Court of Justice (HCJ 5979/07), and the procedure in the appeals committee regarding the legality of the eviction order issued by the state (Appeal 4/09). 2009 – Claim of Ownership and Ruling on Evacuation – Following the announcement by the settler company Tal Investments and Construction in the eviction claim that it purchased the property, the Magistrate’s Court announced that it was not authorized to discuss the ownership issue, and therefore the Bakri family had to withdraw the eviction claim and file a claim in the District Court (CS 3329/09). The ownership hearing took about three years. In April 2012, the District Court ruled that Zakaria Bakri was the owner of the house and ordered the settlers to leave the house within 30 days. Zakaria Bakri died about two months before the verdict was handed down and did not get to see justice done, nor did he get back his home, which he left for a few days in 2001. 2012 – Appeal against the decision to evacuate – the settlers, of course, did not vacate. They filed an appeal to the Supreme Court (CA 4503/12), and aside from their claim that they were nevertheless the owners (the court rejected this claim), they claimed that the District Court was not authorized to order the evacuation, because the statement of claim did not ask for an evacuation but only a declaration that they were the owners. In January 2014, the Supreme Court accepted the claim and sent the Bakri family, now the heirs of Zakaria Bakri, to sue the evacuation in the Magistrate’s Court. 2013 – The settlers claim to have invested more in the property than it cost – Meanwhile, the settlers have submitted another procedure in an attempt to take control of the property (CS 48162-09-13), claiming that according to Ottoman law, if someone has taken over an asset and invested more than its initial value, it buys the property for itself. 2014 – Another eviction claim against the settlers – Immediately after the ruling in the High Court appeal, the Bakri family filed a petition to evict the settlers from their home (CS 12278-02-14). The hearing of the settlers’ claim to ownership and the eviction claim was consolidated, and after years of hearings and testimonies, the verdict finally came down on 12 March 2019. 2018 – A new claim by the settlers in the name of the Jewish sanctuary from before 1948 – When it became clear to the settlers that all the methods and strategies to evade the evacuation were closing in on them and that they were clearly about to lose, they took out a new rabbit from the hat and filed a new ownership claim, this time in the name of the Jewish trust before 1948, claiming that the land on which the Bakri house was built was owned by them. This claim (CS 16328-01-18) was deleted with the consent of the parties in October 2018. The end of the story? It is clear from the first moment of this story that the settlers literally stole the home of the Bakri family. The government refrained from enforcing the law and allowed the settlers to do what they wanted in the house. The settlers took advantage of every legal option and dragged the family through procedure to procedure to exhaust the family in long and costly proceedings, leaving them to despair of ever having their home returned to them. By doing so the settlers bought more time. At present, a ruling is pending against the settlers. They are ordered to leave the house within 45 days. They are still entitled to appeal, and it is reasonable to assume that the appeal will be rejected. Will there be those who will enforce the eviction after all the victories in the courts? This is a political question for which the government has the answer. 1. Cause Palestinians to leave – Severe restrictions imposed by the IDF (prolonged curfews, movement restrictions); Settlers attack and harass, and the Palestinians are forced to leave the house. 2. 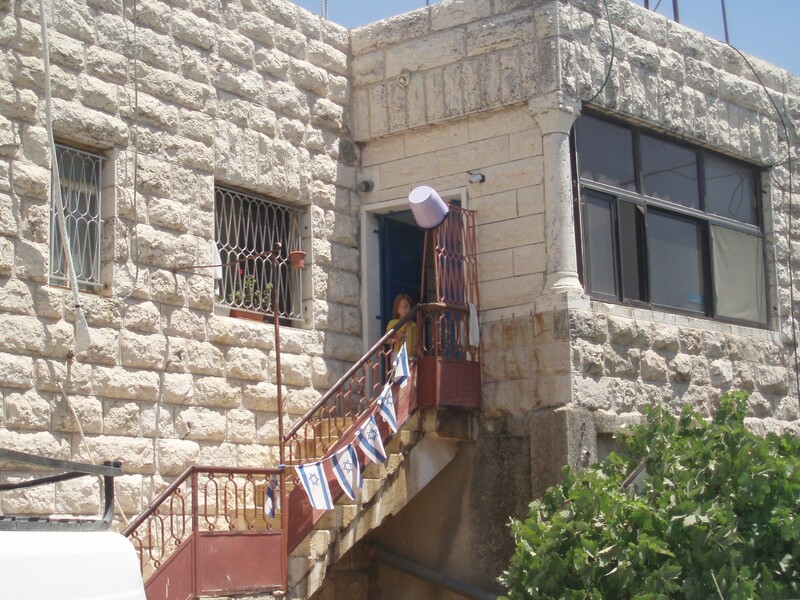 Settlers take over the house – The IDF and the police do not lift a finger to remove these intruders. 3. Palestinians are victorious in court – But there is no one to implement the ruling. The state does not help. 4. Palestinians petition the High Court to force the state to enforce the law – Settlers exhaust the state and Palestinians in legal proceedings, and appeal committees to prevent enforcement. 5. Settlers “invent” the purchase of the house by forged documents – The parties enter into years of trials and proof of ownership. 6. The Palestinians are winning again in court – But the settlers are again initiating proceedings to delay the execution, this time with an interpretation of Ottoman law that supposedly allows them to receive the property. 7. Palestinians win again in court after years of debate and proof. 8. The settlers now have 45 days to leave or appeal the ruling in the District Court.